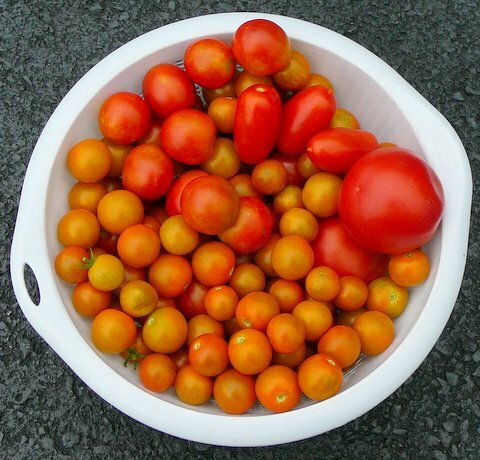 I’ve just picked a colander full of tomatoes, so I’m officially declaring the beginning of Tomato Harvest 2010 at Meadow Glenn. I had picked a handful of Sungolds last week—and another handful earlier this week, but when I saw red and gold fruit from our kitchen window, I knew it was time for serious tomato picking. In a few minutes I filled the colander with two small Big Beefs, seven Juliets, several handfuls of Sungolds, and more than 20 Red Alerts. 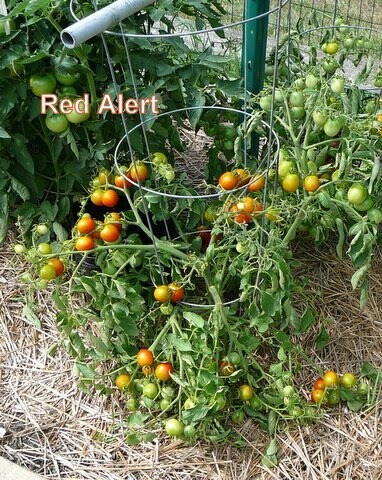 The Red Alerts are one of my two “test” varieties for 2010. When I ordered other seeds in late winter, Totally Tomatoes Seed Company sent me a free trial packet of 20 Red Alert seeds. Generally I’m not impressed by such gifts, but, hey, nothing ventured, nothing gained, so I started the seeds, thinned the seedlings to six, gave four to friends, and kept two for our garden. I’ve found Red Alerts to be, well, unusual. The plants seem to have as many fruiting branches as leaves. From a distance you might think the plants are all tomatoes and no leaves. Each fruiting branch has eight to 10 slightly elongated golf-ball sized fruits. I counted 160 on one plant. I measured one plant, and its highest leaf is 27”, and the plant is 30” wide, so these shorties really don’t require staking and should work well in container or patio gardens. The Red Alert tomatoes are juicy, sort of mid-range between “sweet” and “acidic” in flavor, but not on a scale that makes me want to shout “Wow!” or promise, “Must plant again next year.” At the rate the Red Alerts are ripening, fruit production will span a relatively limited number of weeks, perhaps reflecting the variety’s determinate DNA. I began picking 52 days after transplanting, so Red Alert might be a good “early” tomato to tide me over until the big ones mature if I didn’t have Sungolds and Juliets. The big producers in my tomato patch the next couple of weeks will be Red Alerts, Sungolds (“Wow!”), and Juliets (“Must plant again”). The big red slicers are shaping up well, but I’ll just have to be patient a few more days or weeks. I spied three huge Brandywine heirlooms that promise mouth-watering sandwiches to come, and rapidly enlarging Celebrities promise more colanders full of big red slicers. But all is not well in the tomato patch. While picking, I noticed some lower leaves were splotched and yellowing, so I picked and removed them from the patch. The problem is an endemic fungus disease called early blight. At this time of the gardening year, I think the best tactic is to slow its spread by removing affected leaves. For additional information about early blight on tomatoes, including a photo, CLICK HERE.